Founding members knew instinctively what their roles were. After all, they were the ones who created and filled them. But as our TEDx Team grew, new volunteers were needed for expansion and replacement. Good recruiting requires clear explanation of not just the tasks, but also their place in the wider scheme of things. Hence, out of necessity, my organizational structure quest was born: finding one which would best describe our Team. Initial ideas, influenced heavily by TEDxManual, gravitated towards natural division: Speakers, Partners, Registration, External Comms, Venue etc. Our Team’s history was reflected in names and functions slightly different from those found in the Manual. Still, each field was distinct and looked self-contained on paper. Parts were mutually exclusive and collectively exhaustive. Probably all event organizers (and all managers) will agree that most problems are born on the edges — along the borders of silos we so readily split up and put ourselves into. Speakers subteam (Steam) thinks Registration subteam (Reg) will print ID badges for speakers, but never asks about it. Reg thinks Steam has dealt with all things regarding speakers and assumes they would ask if anything had to be done. Nobody talks, badges end up not being printed, actual speakers end up being mildly dissatisfied or outright pissed off for not being treated professionally. While in our case this story had a better ending, this is not an imaginary example. Just as publishing out-of-date information about speakers (Speakers / External Comms), not publishing a partner’s logo on your website (Partners / External Comms) or having problems with aspect ratio, file format, audio, and video in speaker’s slides (Speakers / Venue), to name a few. Most are minor things, but they can grow to big problems. Most importantly, they are all easily avoided. (B) issues assumed to be someone else’s responsibility and never discussed by interested parties. (B) contains worse problems. They tend to reveal themselves once they actually have caused harm, not before. Part of why this happens are people sitting in silos, not talking with each other. And part of why people sit in silos is they are told they belong in one, not an organization as a whole. This happens in companies large and small, and it also happens in TEDx Teams around the world. My initial ideas for the structure were not a part of a solution for this. They were one of the root causes. Drawing borders instead of connections. I came up with a part of the solution for this by rearranging post-it notes. We encourage our speakers to use post-it notes when they start thinking about their speeches. As a tool they are perfect at this stage. You only put the main points on them and can easily change their order. That’s precisely what I was doing when, by chance, I arranged notes with Speakers, Partners, Registration etc. in a big circle. Something new here. Not a hierarchy, not a matrix. A circle. Genius, I thought to myself and added more details to this scheme. Where’s the licensee? Walks around to check whether everything works. Where’s our TEDx? Right in the middle. We all take care of it together. How do we deal with problems on the borders? We talk with each other. Is there a good analogy to this? Sure there is! The event is a campfire and we’re the village surrounding it. A village. Then it hit me. Singapore is many things and a village is certainly not one of them. And yet that’s the spirit of the local TEDx Team. I had an opportunity to help them a couple years back during my exchange in The Red Dot. Kampong — that’s what they call it after the Malaysian word for village. In this high-tech city-state with huge financial sector, a group of volunteers claims to work in a village. Together. For passion, people, and purpose. Kampong itself is not a structure. It’s a spirit. A culture. The answer was there all along, in my memory, waiting for rediscovery. It was both revelatory immediately after realization and obvious once described. Has really nobody thought about it before? Well, yes and no. 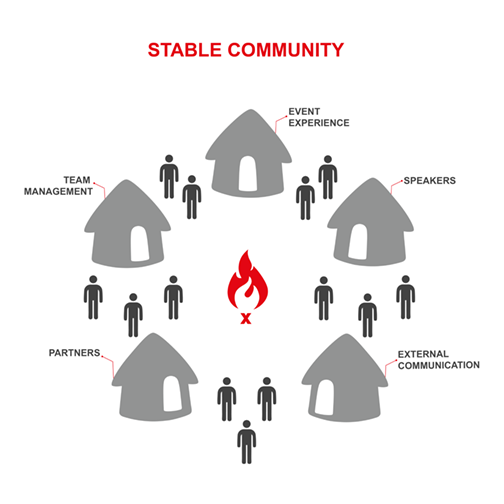 Campfire / village analogy is a type of circular and organic organizational structures. What clearly differs it is not putting CEO in the middle. Team doesn’t revolve around a person, it revolves around a purpose (or a product). What else? It perfectly catches the development of a typical TEDx Team. And many other organizations, including commercial ones. 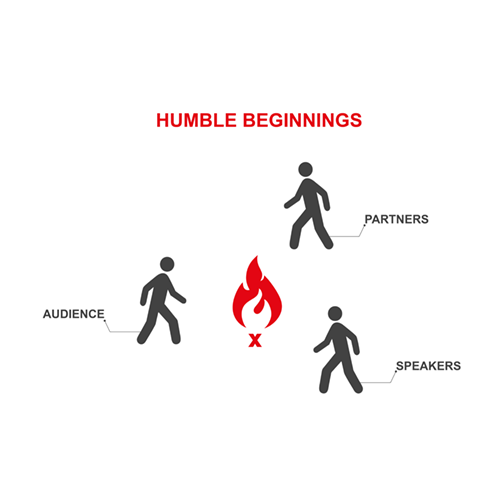 At first you have a few people sharing one purpose — their campfire. Responsibilities are often shared on the fly, based on personal preferences. That’s what a first, single TEDx event is. Minimal structure, lots of improvisation and fun. Over time, things get serious. Event grows, more people join. Work has to be coordinated. Founding members move to more strategic positions, create subteams (represented as huts) and talk with other leaders. As the experienced bunch they typically decide about the size of the campfire and direction of growth for the village, but the rookies are the ones who actually execute it. They are closer to action, adding new logs. Clearly, members of all huts have to coordinate in order for the campfire to expand or even just be sustained. And the licensee? Might be anywhere, except for being right in the middle, grilled on the fire. Making sure the village is both a structure and a culture. More detailed visual might seem overwhelming at first. But it serves well as a tool for onboarding and a constant reminder of the Team spirit. 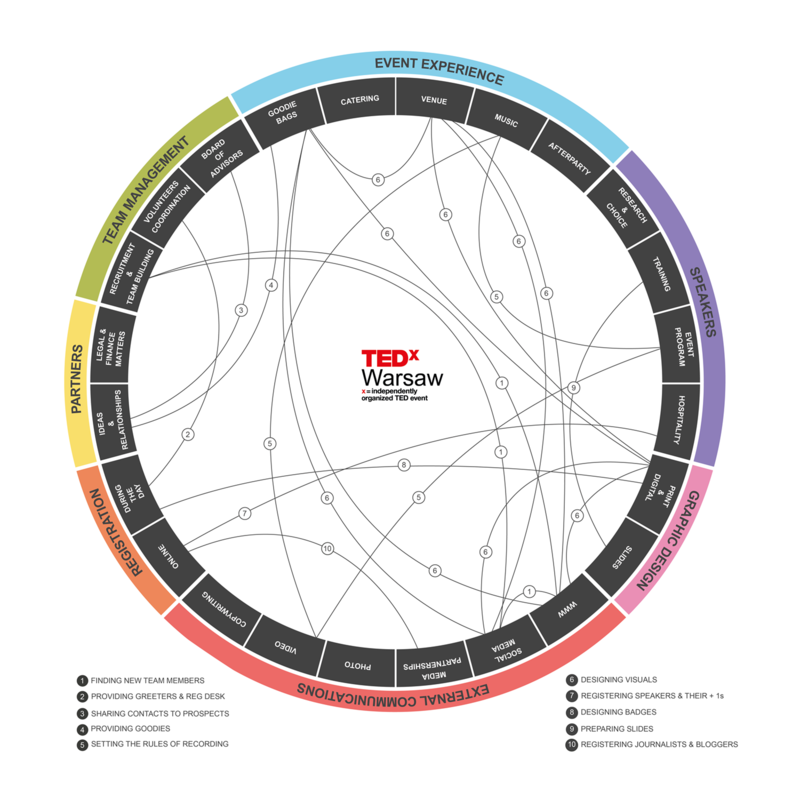 The list of connections is NOT exhaustive and the structure itself is based on how we divide responsibilities at TEDxWarsaw. Yours might look very different. Being flat doesn’t make this structure dimensionless. There’s seniority (the further out you are, the more senior your position) and there is scope of each team’s responsibilities. It’s a good practice to be close to people you share most connections with. Volunteers are still assigned to one set of responsibilities, like in Manual. The difference is better visualisation of actual relationships, and emphasis of collaboration. Now, does this solve all of your problems? Certainly not. But it does show an approach helpful with avoiding problems. Take it, talk with your Team about their goals and worries regarding the upcoming TEDx event, create a list of shared issues, and get to work in the right spirit. Adventure awaits! Visuals by Adelajda Kolodziejska, creative help by Ralph Talmont.